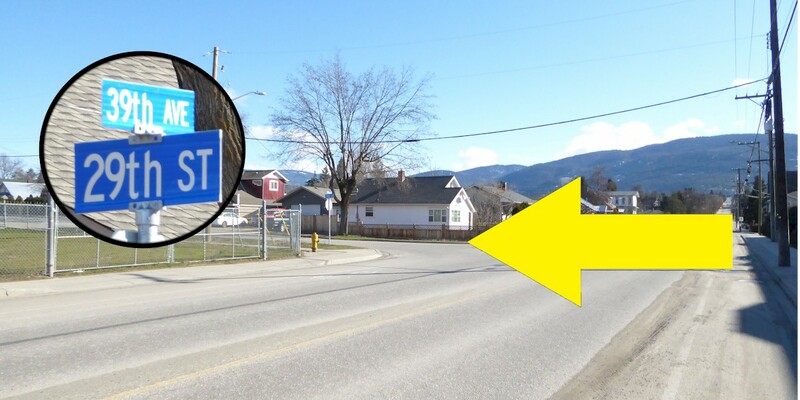 All routes begin at the Vernon Recreation Centre, 3310 37th Avenue, Vernon BC, V1T 2Y5. There are washrooms, a café and plenty of parking depending on scheduled events. The distance calculations for this route begin at the bridge at the main entrance on the east side of the building. Generally speaking, Vernon Avenues (Av.) go East/West (E/W) and Streets (St.) go North/South (N/S). 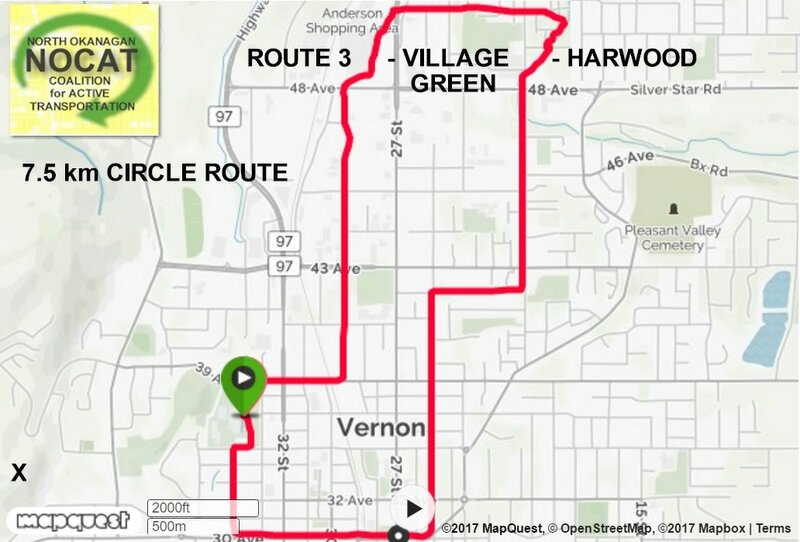 Route 3 is a loop trail that goes north to Village Green Centre, east to the BX Creek Trail and returns via Harwood area and through Historic Downtown Vernon. Disclaimer: Please take responsibility for your own actions, watch for traffic, be careful. 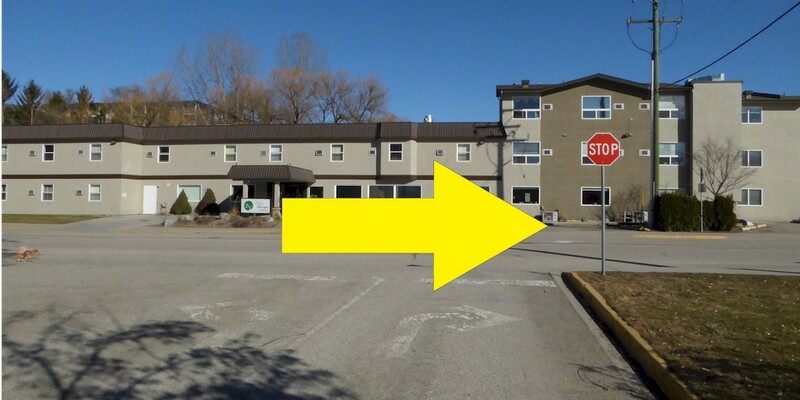 ​N through the parking lot to driveway at 39th St. turn right. At 0.29 Km, E through intersection of 39th Av. 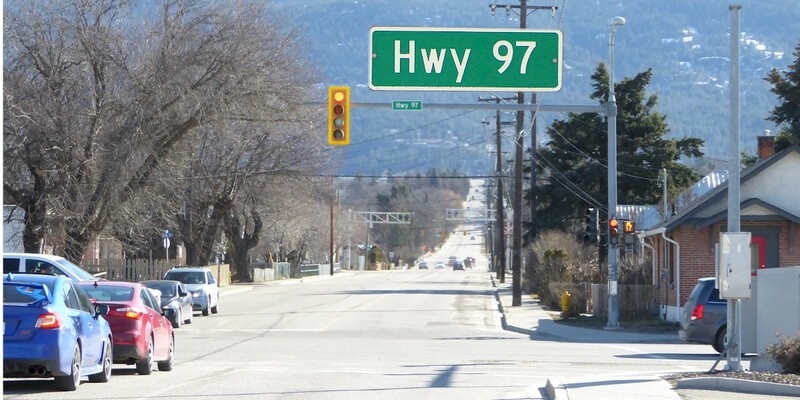 and 32nd St. (Hwy 97). 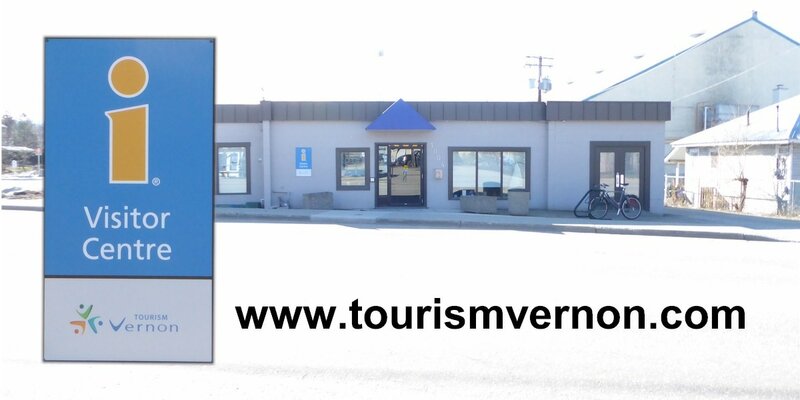 At 0.46 Km, Drop in at the Vernon Visitor Centre for information about local events and markets. 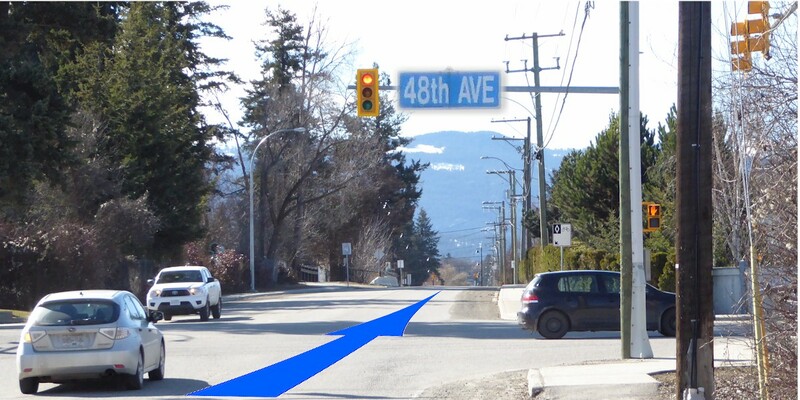 Continue North to Village Green Centre (VGC) at 48th Av. 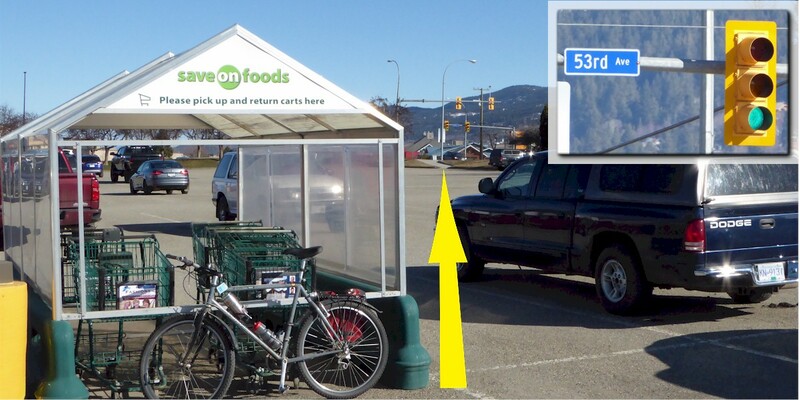 Proceed North to the SaveOn Foods area. Exit the Village Green Centre property via pathway on the NE side of the SaveOn parking lot which connects with 53rd Av. heading East. 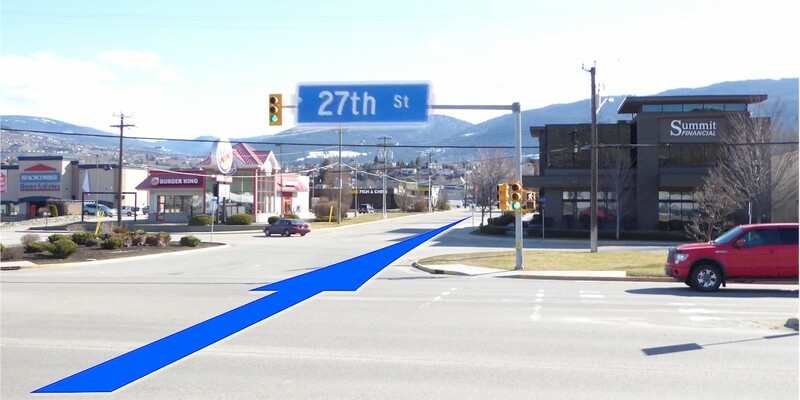 At 2.37 Km, Proceed East on 53rd Av. to the path by the Heron Rookery at the intersection with 24th St.
At 2.61 Km, Look up and to the right, S, on the corner of 53rd Av. and 24th St. for the Heron Rookery. Also on the right you will find Okanagan Spirits. Cross 24th St. and continue East along the path. The Path becomes 53rd Av. again. 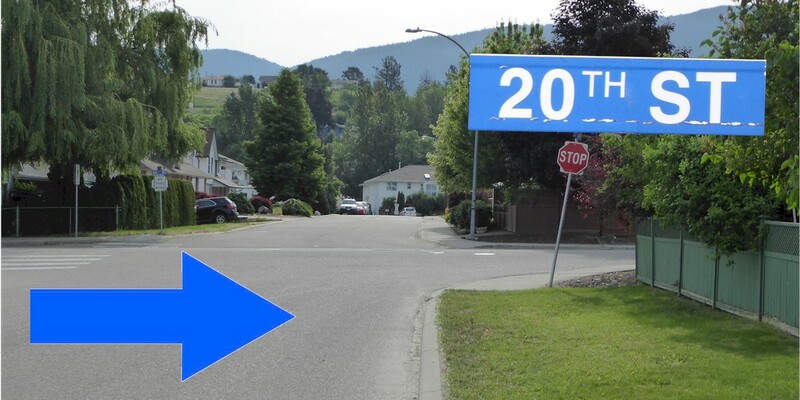 Continue on 53rd Av., to 20th St.
At 3.0 Km, turn right, South, on 20th St. 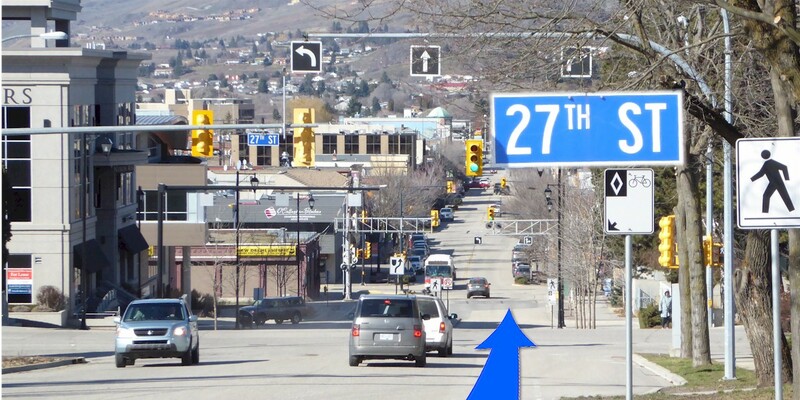 Proceed South on 20th St. for 1.5 blocks to join the Harwood multi-use trail on the West side of the street. Continue south on the Harwood multi-use trail to 43rd Av. Cross 43rd Av., continue south 1 block to 42nd Av. 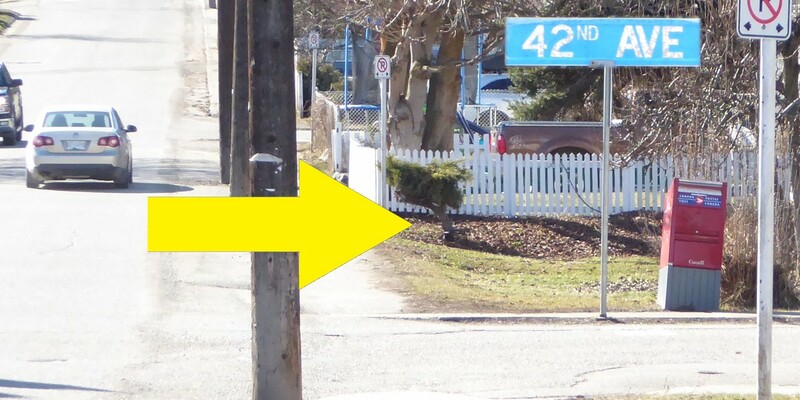 At 4.2 Km, turn right, West, on 42 Av. 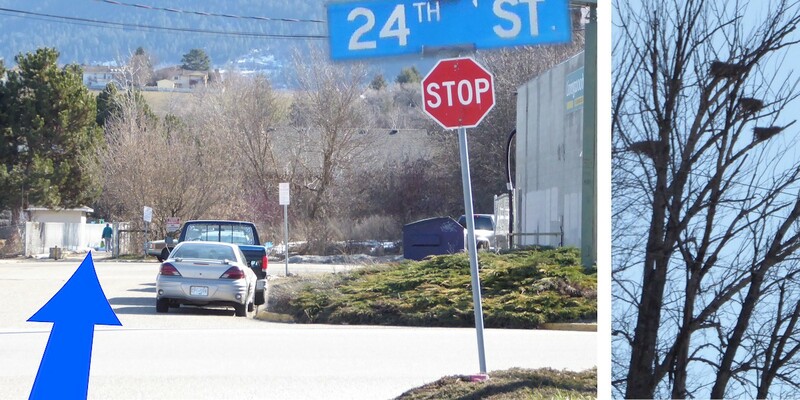 continue to 25th St.
At 4.6 Km, turn left, South, on 25th St. continue South to 39th Av. 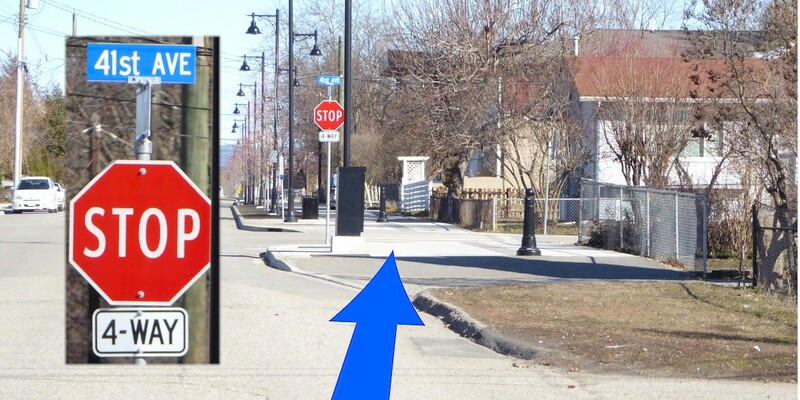 OPTION: At 5 Km. 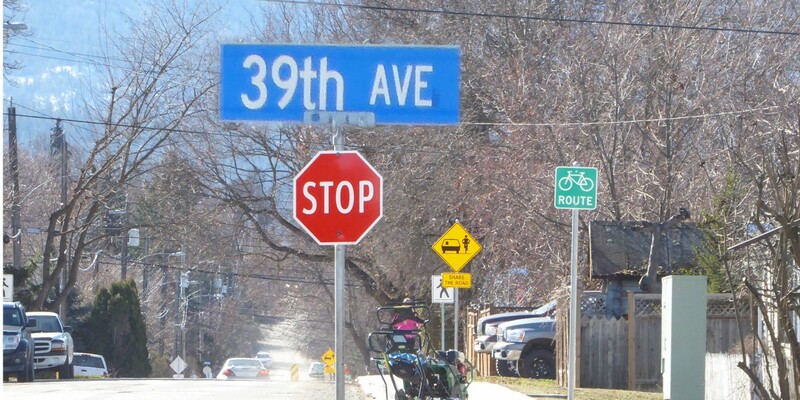 To cut the ride short or go to Bean To Cup Coffee House, turn right on 39th Av. The Rec Centre is approximately 0.7 Km away. 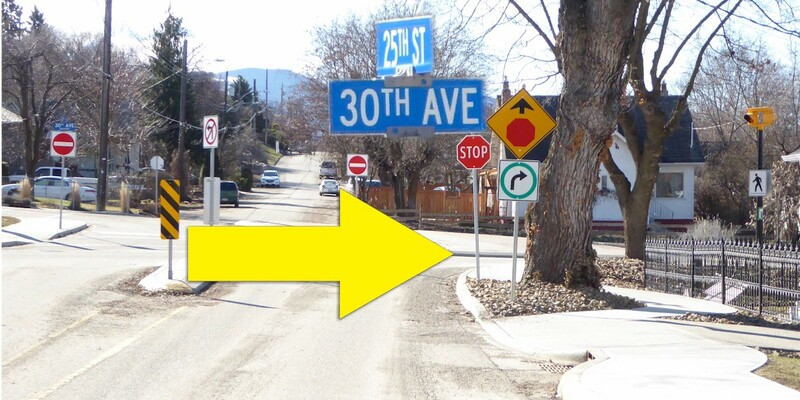 Continue South on 25th St. until 30th St.
At 5.7 Km, turn right, West, on 30th Av. 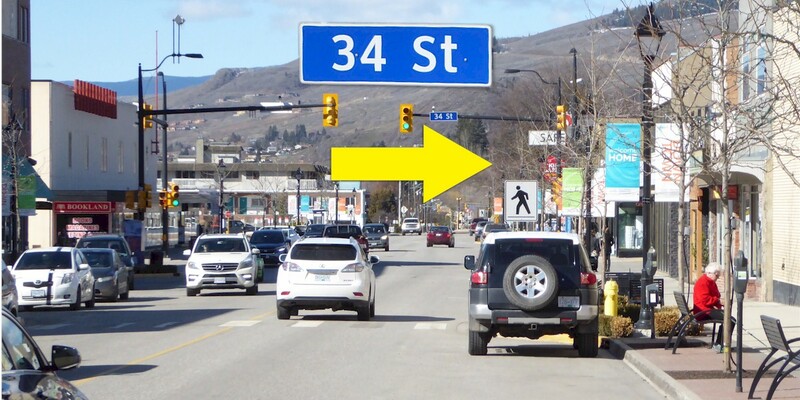 Proceed downhill, crossing railway tracks, into Vernon's Historic Downtown. 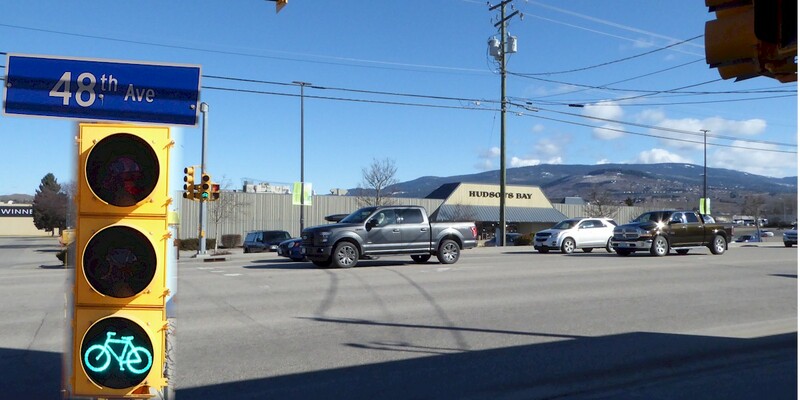 Visit the many interesting shops and enjoy a meal at one of Vernon's many eateries. When you are ready, Continue West on 30th Av. Continue along 34th St until it dead ends at 35th Av. 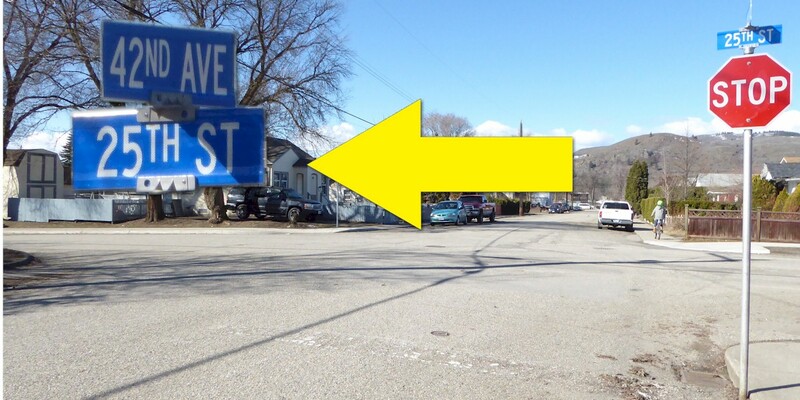 At 7.1 Km, turn right, East, of 35th Av. 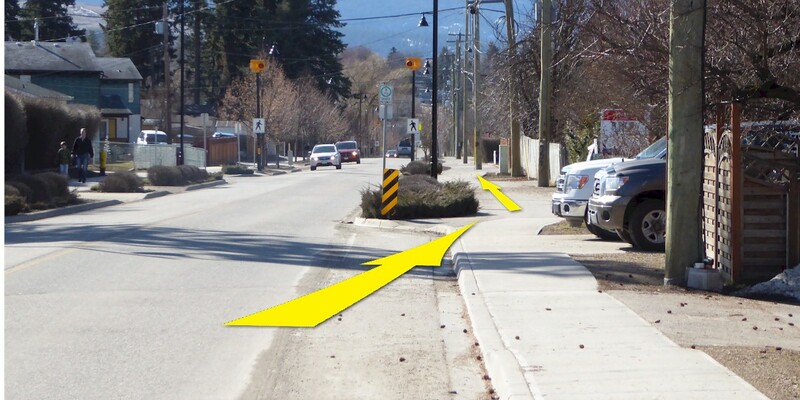 After 30 metres turn left, North, into Rec Centre parking lot at 7.34 Km.